I'm really excited to be a part of the first benefit show of the year at Leanna Lin's Wonderland! I've donated three pieces to this awesome show, benefiting the ACVIM foundation. This was a show that I was really excited to be a part of, as I have always had a dog, and know how much the four-legged cuties can enrich our lives! 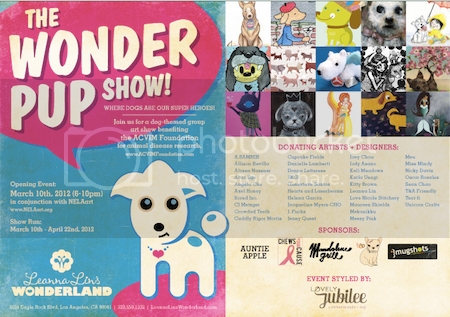 Leanna Lin's Wonderland is excited to curate our 1st art benefit for 2012 called WonderPUP ...where dogs are our superheroes! The ACVIM Foundation is a non-profit organization created in 2000 to support and advance the work of specialists in the American College of Veterinary Internal Medicine (ACVIM): small and large animal internists, cardiologists, neurologists, and oncologists. Because clinical studies in veterinary medicine are severely under funded, ACVIM specialists have long depended on the generosity of private donors and industry sponsors to support their research. The ACVIM Foundation exists to bridge the gap between available funding and the vital work that needs to be done. In addition, the ACVIM Foundation works to fulfill the need to raise public awareness that specialty medicine exists for our beloved companions. Through this education, animals can receive the best healthcare available in order to live longer, healthier lives.